Don’t miss the Adams County Heritage Festival, Sunday, Sept. 16 from noon until 4 PM. Free performances all afternoon: Rovin’Boghoppers (Irish), Rebolu (Ecuador/Colombian), Shree Dance Academy Dancers (Indian dancers), Klinger-McFry (Root and Cajun). 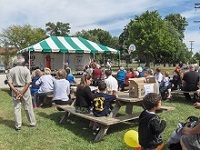 Ethnic food and displays, children’s activities, craft demonstrations, kids’ bicycle parade and non-profit booths. No admission fee for this family event.